If I had to list my talents, getting dirty would definitely be in the top five. Other people somehow manage to evade dirt's magnetic attraction, but I always figure that it's better to enjoy the world than stay clean. Or maybe I'm just rationalizing the fact that I am completely incapable of thinking before plopping down on the ground or pushing my fingers into the soil. Have you ever read Beatrix Potter's The Tale of Tom Kitten? That's me in a nutshell. As a case in point, consider our visit to Everett and Missy's house a few weeks ago. At the end of our farm tour, I was filthy and soaked from the waist down while everyone else looked pristine, so I wasn't too surprised to be the recipient of the thoughtful package above. 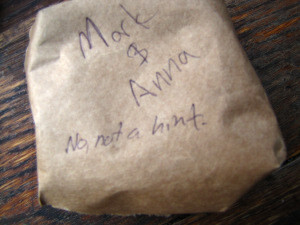 Of course their beautiful homemade soap isn't a hint. What could they possibly be hinting about? Thanks for the great hike and the awesome soap, guys! At least one part of my farm day is now pristine, thanks to Mark's invention of a poop-free chicken waterer. I thought about maybe not writing that, but oh well. We LOVE giving away our soap. As Missy reminds me, some people (particularly suburban-dwelling family members) don't really want a bar of soap for Christmas, so we have to figure out other things to give. But I know you and Mark would appreciate something hand-made from scratch. PS: Your stove looks great! PPS: After looking at your squash pies I think we know what we're going to do with ours. I'm glad you wrote it -- I loved it! 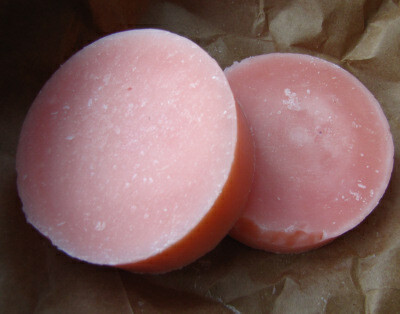 I think that hand-made from scratch is the only way to give presents --- everyone should appreciate your soap!